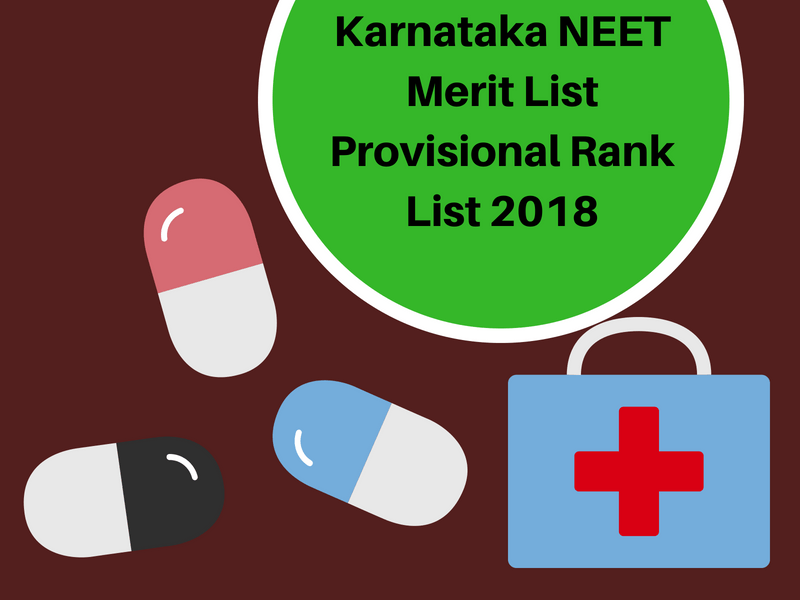 Karnataka NEET Merit List 2018: Karnataka Examination Authority (KEA) has announced Karnataka NEET Merit List (Provisional Only) on 27th June 2018 on their official NEET page. Candidates who have filled the registration form from 15th to 21st June 2018 and paid the fee successfully will be able to see their names in the Karnataka NEET Merit List 2018. The State Merit List is available on www.cetonline.karnataka.gov.in in a pdf format. Candidates can easily download it from there as well as from below. As we know, CBSE NEET is the only way to get admission in medical and dental colleges in India. It is annually conducted by Central Board of Secondary Education (CBSE) to fill all medical and dental seats in India. This year, NEET was conducted on 6th May 2018. Update 27/06/2018- Karnataka NEET Merit List 2018 has announced today on their official NEET page. Candidates can check it from below. More than 12 lakh candidates have appeared in this entrance examination. This is going to be a very tough competition because the number of govt medical & dental seats are less in comparison to applied candidates. CBSE has announced NEET UG 2018 Result on 4th June. In this article, we are providing information about “Karnataka NEET State Quota Cut Off Marks 2018 & MBBS/BDS Merit List“. Karnataka Examination Authority and Consortium Medical, Engineering and Dental Colleges of Karnataka Department will conduct State quota NEET counselling in Karnataka State. The online counselling registration form was available on the KEAs official website from 15th to 21st June 2018. Interested candidates filled the online registration form. After completing the registration process, KER/COMEDK will publish provisional merit list. Only those candidates will be eligible for the state quota counselling who will have their name in provisional merit list. But to appear in the merit list, candidates have to first register for the counselling. Below we have published the complete Karnataka State Quota Counselling Schedule 2018. Candidates are advised to keep checking this site for the latest updates. This year, minimum qualifying criteria of NEET-UG, 2018 will be high than the previous year. According to our experts, the NEET 2018 Expected Cutoff is given as below. Well, the official NEET cut off will be published soon by KEA/COMEDK. Only those candidates will be eligible for the state quota counselling who will secure equal or more than marks to the official cut off. Below we are providing expected cut off Marks for MBBS/BDS admission. The final cut off marks will be published later. First, fill the COMEDK State quota NEET Counselling registration form and then wait for the merit list. I am from kerala and qualified for in NEET 2017(rank-33020,marks-483). I would like to seek admission in private medical colleges in karnataka. I understand state quota seats in private colleges is only for karnataka residens. For 15% all india quota seats and management seats do i need to submit application through KEA? Please advise. Thanks. No, for 15% India Quota seat, you need to register at MCC. Thanks for the reply, for management quota seats, do we need to apply through KEA or apply to individual colleges? No, you can directly contact to the college to get admission through management quota. AIR rank 53217 neet marks 441, is there any way, can we get mgmt. quota in good collges in banagalore? Yes you can get a seat through mngmt quota. So try it u will get but expensive. i got 182. can i apply for karnataka state quota? I have scored 391 marks in 2017 neet…. Will I get a govt seat in karnataka ???? Don’t be sad, try in state quota counselling. I got 334 marks in NEET.I belongs to 3B category can I get seat in karnataka ? I have got 289 marks in neet. Can l get a seat in 3b category. I got 390 marks in meet 2017. I am from uttar pradesh, general category. Can I get a private medical college in Karnataka from seat quota?? Last year neet k kitne marks tak cut off gya tha comedk ka? Kindly tell Sir! … please. Sir I have got 561 marks in neet. Will i get seats in 15% state quota.. Or i should go for 85% quota.. Please suggest me to get better college. Will I get a govt seat in Karnataka with 348 marks in NEET. I belong to SC cat? Sir I have got 397 in NEET Can I get in State Quota? I have got 321 marks in neet 2017.will I get a MBBS college through comedk .I am from Bihar and my category is general. Can I get MBBS seat in Karnataka state wise. I got 432 marks in neet will i get medical seat in karnataka? I have got 221 marks in neet this year.. So m I eligible for counselling in karnataka???? Got 399 in neet 2017 with 92.5 percentile any hopes to get seat in private Medical colleges in Karnataka? Sir,i have got 290 marks in neet so wht may my rank and will I get medical seat atleast in any private clg of Karnataka through KEA . And also sir I am thinking to apply for AIPVT will I get seat in Karnataka for this marks 290 this year. I have contacted comedk and they said this year private medical college seats in karnataka also will be filled through KEA. However in KEA site the CET registration for NEET candidates was until June 27th only. DO you have any information, i am a resident of Kerala looking for admission in private medical colleges. thanks. Regarding this there no confirmation in Karnataka but KEA will only fill state quota seats and u can fill only KCET registration that is only for Karnataka students. But there is talk that KEA will conduct counselling for comedk seats to that u have register to comedk which still not started application procedure. So wait for comedk application to start. There is no another way legally but keep checking kea.kar.nic.in website they may extend date if ur Lucky …but less chance of extension of date. Whts ur cet veterinary rank.. I think u will get seat in Karnataka in atleast in private clg if ur luck works will be in gov. Clg don’t worry all the best …. i got 343 marks , all india rank is 126980 . I got 368 marks n neet n I belong to sc cat can I get a seat in Karnataka n wch clg I may get…. Sir is 399 in neet 2017 ,UR category with tulu quota belongs to Karnataka, any hopes in private medical college? Sry to say this its difficult get seat both in AIQ and state quota bcoz of more competition ….so I advice u try for comedk if luck works u may get seat or try nxt year by joining any gud Coching . Sir i have got 468 marks ,can i get a seat under comedk? I think u have applied for kcet 2017 then it’s enough u can participate in common counselling for medical seats in Karnataka…if u not applied for kcet u have register before July 15. Sir I have 451(obc) ,marks in neet 2017, and is there any chance for me to get a MBBS seat in Karnataka . any body please leave a reply???? MY RANK IN NEET 2017. UR CATEGORY, FROM KARNATAKA IS 80000 .WHAT MAY MY KARNATAKA STATE RANK..? Sir my I got 246 marks I am sc ctg will I get seat for mbbs in state wise. My daughter got 157 in neet. Belongs school category. Cat. Ranking is 39900.Will she get mbbs seat in karnataka. sir , i have 470 marks in neet 2017 . can i get govt. seat in karnataka through state quota? i am from ap i can also apply for karnataka mbbs ? my son got 300 marks in neet 2017, he is of karnataka general category. Is there any chances of getting mbbs or bds in karnataka colleges under state quota? There no chance of getting gov. medical seat so try for comedk or management seat. SIR , I hv got 261 marks in neet and i belong to sc category and hyderabad karnataka ..will i get a govt mbbs seat ? sir , I hv scored 261 marks in neet exam . I belong to sc category and hyderabad karnataka..will i get a govt mbbs seat ? Yes ur sister will get medical seat ….try to get seat in Madikeri and Chamarajanagar gov.medical clg u will get there pakka. With 2767 Karnataka state rank, can I get medical seat in private colleges ? I got 480, can I get Govt medical colleges in Karnataka? Weather combined merit list or kar merit list is considered for kar MBBS state councelling ?? Karnataka merit list is used for allotment of seats of government quota seats only and combined merit list is for private quota seats. If not try in private quota u will get seat surely. .
Sir, I am from Maharashtra and I got 439 marks in NEET.Is it possible to get admission in Ramaiyah Medical College or Kempegauda Medical College as I have completed document verification process. I don’t know ur state ranking but for St cat atleat for still 9000 it will allot to waive for it…. I did not get the seat in mock allotment it means I won’t get sir?? My state ranking is 9787 in Karnataka will I get a medical seat sir.? U will not get gov medical seat if u belongs to any category other than sc and St.
And by seeing mock allotment cuttoff for private quota medical seat its difficult to get medical this ….don’t lose hope try still last otherwise try nxt year… All the best. I did not get a medical seat in mock allotment will I get in first round sir ? My state ranking is 9787 I belong to sc category. Will I get a medical seat this year sir in Karnataka? Can i get any seat in Karnataka with state rank 18038 and having category sc??? Sryy..u will not get gov.medical seat try nxt year..
what is state of eligibility? mine is Karnataka and how can this state eligibility help me for neet 2018? wt is the minimum karnataka state rank or AIR to get govt medical seats? Sir i m 55 percent lower limb disabled. Will they check again my limb in medical examination verification even i have certficate issued by govt hospital in karnataka??? Not sure about AIQ but you can get in State Quota seat. Sir I got 340 in neet 2018 am bc b minority can i get B category seat in karnataka..
Hi I may 450+ I may get govt seat…I belong to general….. I am expecting 440 in neet 2018 . Will i get a govt seat in private medical college in karnataka. Iam a general merit student. I got 315 in neet,can i get a seat in mbbs karnataka . what is the procedure for admission into private medical colleges after NEET score for non domiciled candidates. Do we have to apply through KEA or directly to the college? 246 marks in neet 2018 and I’m from obc 3a category from karnataka.Can I get mbbs or bds seat in karnataka? Hard to say, Please wait for the state merit list. I have got 391 marks and my all india ranking is 84860. I belong to UR category. Can i get government seat in Karnataka? 153, is very low for govt college even for ST category. I got 256 marks in neet 2018, and I’m an SC category student. Do I get MBBS govt college in Karnataka? i have got air 21000 rank in neet will i get a government seat in a government college of karnataka. please suggest me can i get medical seat my score is 255 and my rank under OBC 105000…. 255 is very low, Try in state quota counselling and see what happens. Sir I have scored 206 marks in the neet 2018 exams. Can I get mbbs seat in Bangalore(private or government college).please suggest me. You have scored very low marks its very hard to say anything. I scored 281 marks in neet if can I get any MBBS seat??? Sir, I got 330 mark in neet 2018. Can I get a seat on MBBS or BDS in Bangalore? I got 200 marks.. I got 35k as my category rank ..
Can I get seat in karnataka? Date is not announced yet. Please wait we will update here. 366 is not enough for govt college. You can get private college only. The date is not announced yet. We will let you know when it announces. Will a non- karnataka candidate be able to register for karnataka counselling? I did my puc in Karnataka &tenth grade in Andhra Pradesh. Hello Sir, I am from Maharashtra Domilcile candidate having 427 marks in NEET 2018 with AIR 58087 with general catagory. Shall I get a good, reputated Govt./ Pvt. medical college in Karnataka or any other state except Maharashtra? Hard to say for govt college you’ll get private college for sure. Hello Sir, I am from Maharashtra Domicile having score 427 with AIR 58087 with General Category. Can I get any reputed Govt./ Pvt. college in Karnataka or any other state? I have got 413 marks in neet( general category) and my AIR is 67616 and I am from Bihar. Am I eligible for any private college of Karnataka? hey!I belongs to up getting 390 marks in neet 18 wants to take admisssion in karnataka in some good medical college. can i get private college in karnataka with this much marks. My daughter got 506 marks and AIR of 19348, in NEET 2018 and is not from Karnataka. Is she eligible for a seat in any of the Government medical colleges in Karnataka. My neet score is 127. Can get any college karnataka management seat? i got 499 in neet .are there any chances for govt. medical or dental seats in karnataka? I got 444 marks in neet 2018 and got 47560 all India rank . Will I get a govt medical seats In karnataka? Hi, My All India Ranking is 164227 and Karnataka State Raking is 6438. What are the possibilities of getting medical/dental seats? Sir ,I got 273 score in NEET 2018 and belongs to General Category.Is there any chance of getting seat in private college? I have not seen my karnataka neet state rank how to see it whicj website?